Comment: “This Jesus is ‘the stone that was rejected by you, the builders; it has become the cornerstone.’” A cornerstone is set as a reference point for determining the setting of all other stones in a structure. When we think about Jesus as the cornerstone, we express the understanding that he is central to the structure of our faith. When we first encounter Wesley, he is a boy rejected and ostracized by his peers. As he constructs Weslandia, he essentially becomes the cornerstone of a new civilization. The children, who had previously rejected Wesley, move full circle to become his friends and followers. Comment: “We know love by this, that he laid down his life for us—and we ought to lay down our lives for one another.” This text invites us to think about the ways we love one another. 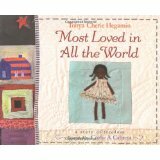 In Hegamin’s story, we read about a mother’s love for her daughter. This mama’s love extends beyond her family to other’s who might need her as well. She sacrifices a life of freedom with her daughter to help save others. Though not all of us may experience such extreme sacrifice or lay down our lives to the point of death, we too can love by more than just words. We are invited to live in a way where love might shine through each and everything we do. Comment: In this reading, Jesus refers to himself as the Good Shepherd. It would be helpful to explore the roles of shepherds with the children in your church. What would it be like to try and protect the sheep from the wolves? Though the story of Betsy the shepherd is quite silly, it gives us an idea of how a shepherd protects and cares for the sheep. Betsy never falters in her duties as shepherd. 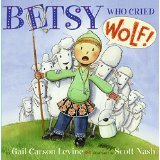 Though the townspeople fail to believe her, and the wolf works hard to trick her, Betsy does everything necessary to protect her flock. This Lectionary Links post was written by regular contributor Noell Rathbun-Cook. Lectionary Links: Sunday, April 29, 2012 by Storypath is licensed under a Creative Commons Attribution-NonCommercial 4.0 International License.